Clonezilla is a free and open source software designed to do disk imaging and cloning, disk partition as well as bare metal backup and recovery. For cloning efficiency, Clonezilla saves and restores only used blocks in a hard disk, enabling it to perform multicast restoring at rate of 8 GB/min on some high end machines in a 42-node cluster. The solution includes Clonezilla live for single machine backup and restore; and Clonezilla SE (server edition) for mass deployment and of up to 40 computers simultaneously. Clonezilla was authored by Steven Shiau and developed by NCHC Free Software Labs in Taiwan. The software is licensed under the GNU General Public License (GPL) Version 2. However, to run Clonezilla, several free and open source software are required such as Linux kernel and a minimal GNU/Linux OS, among others. A product of collective effort and ideas, you get free access and use of the latest build and features created by a pool of developers and contributors. You enjoy the advantage of having the latest updates, fixes and releases since open source software is continually improved upon by its developers. In fact, the last stable release was just this September 2017. As with open source applications, Clonezilla has the backing of a community of developers and users who share insights, ideas and experiences on every aspect of the software. You are provided a rich ground for resources in community boards and forums. 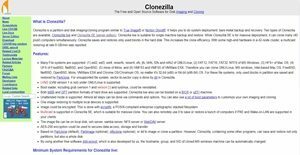 Clonezilla is accessible from various software sites and online repositories where you can easily download it including its source codes and install in your machine complete with documentation and step-by-step instructions. For queries you can quickly go to any of several online forums that carry extensive how-to guides, tutorials and FAQs. If you are interested in Clonezilla it could also be sensible to check out other subcategories of Best Backup Software listed in our database of SaaS software reviews. Since each company has particular business wants, it is advisable for them to desist from looking for a one-size-fits-all perfect software application. Needless to say, it would be pointless to try to find such a system even among market-leading software platforms. The intelligent thing to do would be to jot down the various important aspects that require consideration such as key features, budget, skill levels of workers, company size etc. Then, you should do your research thoroughly. Read some Clonezilla reviews and look into each of the other solutions in your shortlist in detail. Such comprehensive research can ensure you discard ill-fitting platforms and zero in on the system that offers all the elements you need for business success. How Much Does Clonezilla Cost? We realize that when you make a decision to buy Backup Software it’s important not only to see how experts evaluate it in their reviews, but also to find out if the real people and companies that buy it are actually satisfied with the product. That’s why we’ve created our behavior-based Customer Satisfaction Algorithm™ that gathers customer reviews, comments and Clonezilla reviews across a wide range of social media sites. The data is then presented in an easy to digest form showing how many people had positive and negative experience with Clonezilla. With that information at hand you should be equipped to make an informed buying decision that you won’t regret. What are Clonezilla pricing details? What integrations are available for Clonezilla? If you need more information about Clonezilla or you simply have a question let us know what you need and we’ll forward your request directly to the vendor.